The cashless taxi service Uber, which originated in Silicon Valley San Francisco, has arrived in Bristol making it the first city in the South West to gain the service. The app allows users to order cabs from their exact location, and watch in real time as their driver moves across the city to pick them up. The service also alleviates the need for users to carry cash, with the app automatically linking to a credit or debit card, or PayPal. 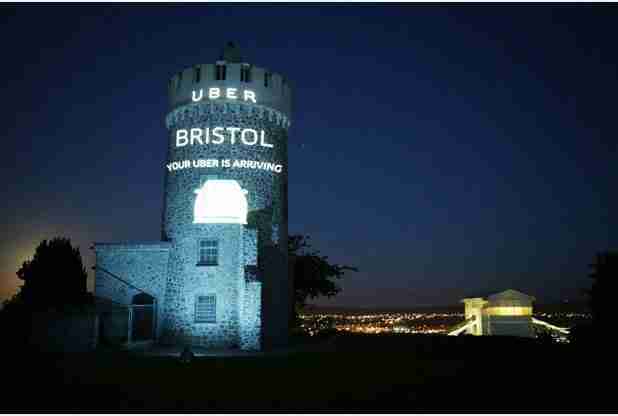 With a fitting choice of an iconic Bristol landmark, Uber chose the Observatory to launch it’s Bristol campaign as it begins service in the city from today. Rachel Thomas, Director of Operations for the Observatory said, “It’s fantastic to have the observatory associated with exciting new companies such as Uber who are moving to the area. With the versatility of the building, and its strong links to the history of Bristol, we’re really pleased to have the opportunity to work with Uber and bring together Bristol’s past and future”. Hundreds of drivers in Bristol have already registered to become Uber “partners”, which offers them the ability to work flexible hours which fit with their own schedules. The service will launch from 4pm on the 5th June, and will be offering first time users of the service a free journey up to the value of £15 .